Elektrica is proud to offer Black Car Service for Cedar Park. Our services extend beyond simple airport ground transportation. We offer wedding car service, corporate black car service, with much more on the horizon. Enjoy the fact that you can have a private, unique tour of the city of Austin and all it has to offer with one of our private drivers. 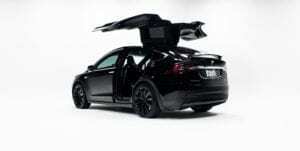 Pick from your choice of Black Tesla Model S, Black Tesla Model X, and Black Tesla Model 3’s. We have also added Black Lincoln Navigator SUV and Black Limo’s to your ever growing fleet. The foundation of a high-class black car service experience is a professional driver who knows the area, how to communicate well, and is a safe and careful driver. Our drivers are experienced and come with integrity to boot. Whether you need Airport Black Car Service or are weighing your options when it comes to a Black Car Wedding Service, or a Black Get Away Cars in Cedar Park, getting driven to your destination in a stunning Tesla Model S, Tesla Model X, or SUV is an experience in its own right.